Dr. Badria Al Awadhi is an outstanding lawyer, outstanding in Law and environmental issues , studied the International Law in London University. 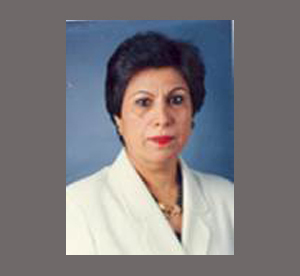 In 1975, she had PhD from London on Legal Aspects of Maritime Pollution In The Arabian (Persian) Gulf, At the international level, Dr. Badria is a member in a number of International organizations such as International Federation of Women Lawyers (FIDA), International Law Association, International Commission of Jurists (ICJ), International Council of Environmental Law (ICEL), established at Kuwait University in 2001. She also served as the General Coordinator for ROPME for over 10 years. As an NGO, she is a founding member of the Kuwait Environment Protection Society and served as Secretary general for the Society for over 10 years. She is a Global 500 laureate. Since 1975, she published several books and articles on various issues including the environment, human rights, women & children rights and books for environmental awareness designed for children. Among the books published: International Law in Times of Peace and War With comparative Study of Islamic Law and its Application in Kuwait, Legal Views on National, Regional and International Events and on the implementation of the Law of the Sea in the Gulf Area.